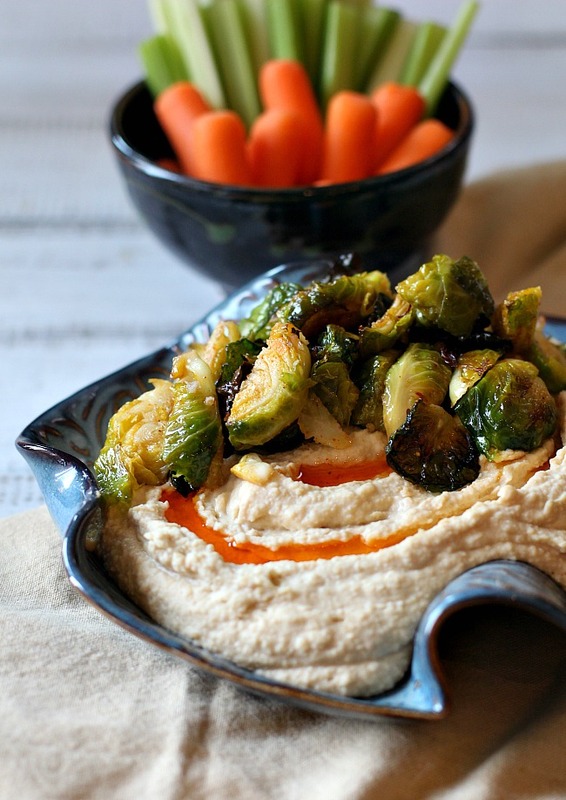 This is a homemade hummus with roasted brussels sprouts recipe. It’s a unique twist on one of our favorite appetizer dips. Add some chile oil and grab a wedge of naan to experience an adventurous version of hummus. Hummus…to be quite frank, it seems I’ve been grabbing for those tubs in the fridge section at the grocery store more often than making it at home. Probably a little lazy and probably because I’ve not been 100% satisfied with my original recipe. And to be even more frank, at times it has distracted me from grabbing a tub of Heluva Good French Onion Dip. I’ve spent the last couple of weeks tinkering with my homemade hummus recipe. This is the recipe that appeared when I recreated an appetizer I loved at a local restaurant, Ya Ya’s Grilled Pita with Hummus. That hummus recipe with olives and feta is my “go-to”, but I was never perfectly pleased with the flavor. Always seemed a tad harsh. I’ve made a couple of changes. A little less of this and a little more of that, and now I’m a happy hummus maker. And it’s so easy to make at home. The hardest part is dragging out the food processor. With that said, a couple of weeks ago, my friend Cauleen was raving about a hummus appetizer she ordered at a local restaurant (sorry, can’t remember the restaurant name), but when she described it as simple with quartered and roasted brussels sprouts and drizzled with chile oil I knew I had to make this one at home! I took it to neighborhood gathering last night and it was a hit. Served with naan wedges and fresh vegetables, this was a crowd pleaser. 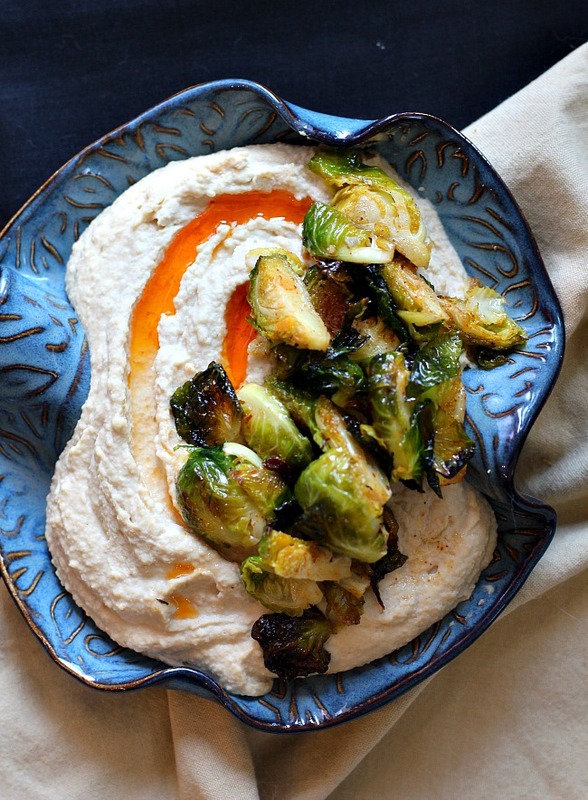 I hope you give this Hummus with Roasted Brussels Sprouts a try. And if you do, please come back and let me know how you liked it and give the recipe a star rating. Your feedback is valuable to me for developing future recipes. 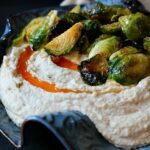 And if you have a unique roasted Brussels sprouts recipe or an interesting hummus topping idea, let me know, I’d love to give it a try. 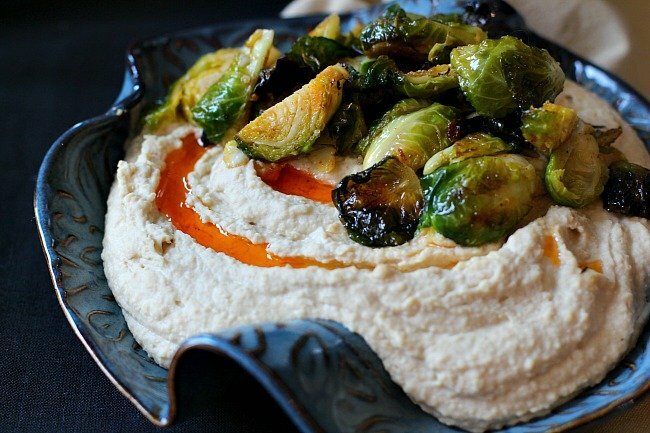 This is a homemade hummus with roasted brussels sprouts recipe. It's a unique twist on one of our favorite appetizer dips. Add some chile oil and grab a wedge of naan to experience an adventurous version of hummus. Turn on the food processor fitted with the steel blade and drop the garlic down the feed tube; process until it's minced. Add the rest of the ingredients (through olive oil) to the food processor and process until the hummus is coarsely pureed. Taste, for seasoning. Adjust seasonings and add more reserved chickpea liquid if you want a smoother texture. Pour mixture into a bowl. Preheat oven to 350 degrees. Quarter the brussels sprouts and toss with 1 tablespoon of olive oil. Place brussels sprouts on a sheet pan and roast for 15 or 20 minutes. Or until they're starting to turn brown in places. Tossing once for even cooking. To serve make a pattern with the handle of a spoon in the hummus. Drizzle the chile oil in the indentation. Top with the roasted brussels sprouts. Serve with Naan or pita wedges, fresh veggies like sliced cucumbers, carrots and celery. If you'd like to make this hummus with dried chickpeas, use 1 cup dried chickpeas - cooked. I’m sharing this recipe over at Meal Plan Monday. I like hummus and I like sprouts but would never have dreamed of combining them. You are really creative. You make your hummus just like I do! I never would have thought to pair it with Brussels sprouts, but I’m loving the idea!!! I love modifying and creating from a restaurant inspiration. This sounds fantastic. I’ve got a brussels sprout pizza from a sort of local restaurant that I am dying to try and then recreate. That pottery was a gift a couple of years ago. Hilbom in Canada.